Here's Adel, in the boat at Damian Callan's studio a few weeks ago, she has some great costumes, and always poses really convincingly. 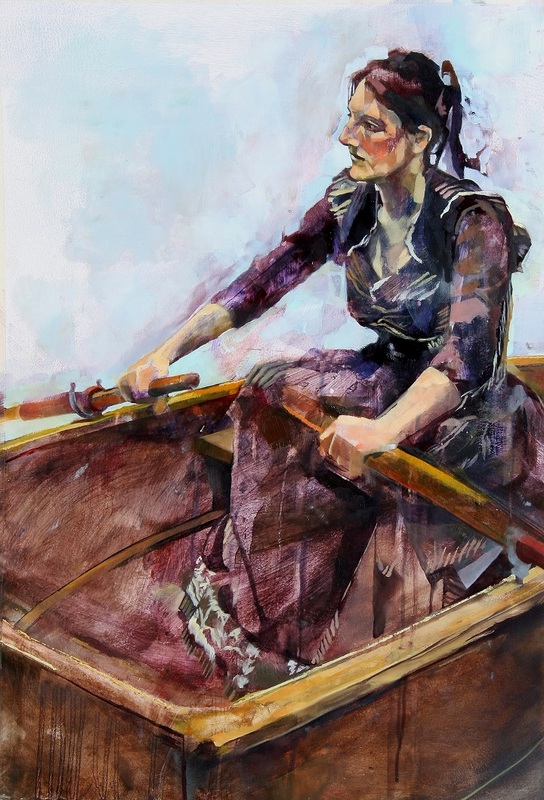 I had the feeling she was rowing around some gloomy lake, lost in her thoughts. It was a lovely scene to observe and describe, measures about 20"x30", and is painted on card primed with gesso. I prefer the smooth card to the textured canvas surface. I started this one with acrylic, applying it with a rag for the most part, positioning Adel and roughing in the angles of the boat. Usually I paint in acrylic for ages to be sure of where everything is, but here I worked a lot out in oil, and found it quite liberating to do. I also remember paying a lot of attention to Adel's face before I really felt I ought to. 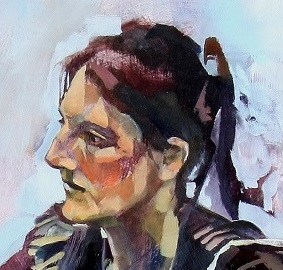 Usually painting the head is the bit I savour at the end, but here I launched into it early on. I think it helped me do less elsewhere. I like that there's very thick paint on some areas, as in the water behind her head, and that it's very thinly applied elsewhere, for example inside the boat. 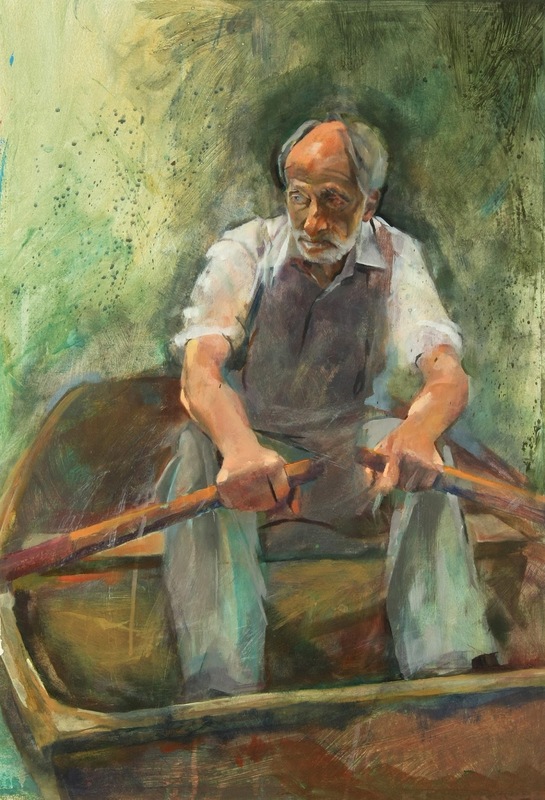 Good having all the lines/ angles of the oars and boat to contrast the figure against, and to provide a simple setting for this lovely seated figure to occupy . Here's Graham, same boat, different day. This was my first time painting the boat in the studio. This time he was definitely on the sea, there's a storm approaching, and he's already having to tackle choppy waves! 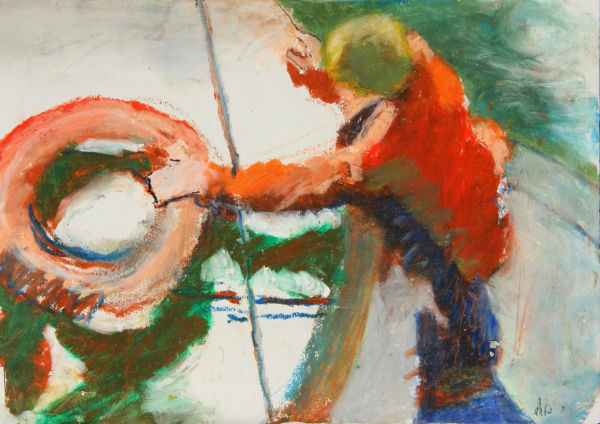 Then again, that could be drooping greenery behind him... in any case for me there's a feeling of action in this painting, a brisk movement in the arms and cautious turn of the head. 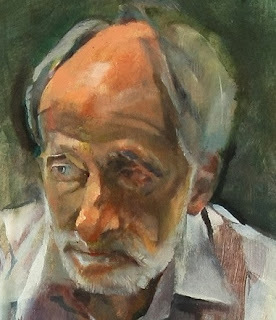 We had the same spotlight on Grahams head as we did for his portrait (first blog post) revealing the line of his brow and describing the particular curve of his head. Seeing these two paintings together for the first time I'm struck by how matt the surface of this painting appears in contrast to the one above. The top painting has a richer texture I think, because it has been largely painted in oil, in this one oil paint is applied more sparingly, mostly on the face and hands. 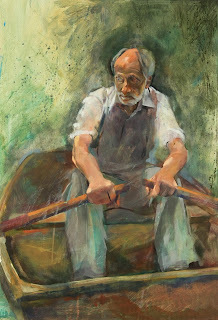 Defining the edge of the boat in front of the figure goes a long way in describing the space he occupies. Since it's the figure that most interests me, I'm happy when the space is quickly and easily described. If you have a boat and willing model to hand(!!?! )...have a shot at painting them, you'll be transported to a watery landscape for a few hours...very therapeutic!